Cummer Gardens sustain extensive damage, suspend outdoor events - The Resident Community News Group, Inc. | The Resident Community News Group, Inc. The Italian Garden at the Cummer includes 11 marble pieces from a palace in Florence, Italy, a three-tiered fountain and benches with a lion motif. 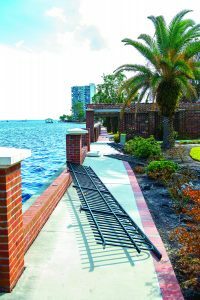 While the long-term impact of Hurricane Irma is still under assessment by public officials, many residents, businesses and nonprofit organizations, including the Cummer Museum of Art & Gardens, are also going through the painstaking process of damage evaluation. Destruction of landscaping is usually secondary to structural damage, unless the venue happens to be the Cummer Museum of Art & Gardens. The historic gardens were severely impacted by Hurricane Irma and will be closed to the public for an undetermined length of time. Fencing torn down along the riverfront is included in the damage at the Cummer Gardens. The Cummer Gardens contain a variety of historic plant materials, including many historic species of azaleas that were planted in Ninah Cummer’s time, in the early 1900s, and cannot be readily purchased. As many of the plant species in the gardens are no longer commercially available, Museum staff has worked over the years to propagate the specimens that remained on the property. The scarcity of some of the historic plant material makes the reconstruction effort a unique challenge. The damage was severe enough, though, that Museum staff is contacting individuals and organizations that may have upcoming events in the gardens. The lower tier of all three formal garden spaces, which are listed in the National Register of Historic Places, remained submerged for more than 24 hours, resulting in the uprooting of plants, detached railing along the river, broken lighting, pervasive salinization of the soil, large amounts of debris, and significant impact to much of the physical infrastructure, including drainage, electric, fencing, and the well that services the landscape. Nearly $1 million has been invested in the gardens in recent years, including the restoration of the historic Olmsted Garden in 2013 and the English Garden in 2017, reconstruction of the Italian Garden Folly, relaying of brick pathways, updating of drainage systems, conservation of sculptures and fountains, fortification of the bulkhead, and installation of new bulkhead railing in 2016-2017. The Garden Folly structure, brick pathways, and English Garden fountain remain intact. While the gardens are inaccessible to the public, the Museum will be offering half-price admission. Should visitors choose to pay full price, half of the admission fee will be applied to the Garden Reconstruction Fund as a donation. “As reconstruction costs are unknown at this time, any contributions are welcome and appreciated to help restore these spaces as quickly as possible,” stated Keris. Members of the community may donate directly to the Garden Reconstruction Fund at cummermuseum.org/garden-reconstruction.